Over the next week or so we’ll be putting up various charts and tables describing the 2014 season. The Bulls themselves have an interesting summary here that’s worth reviewing. And the David Egbert over at Rays Colored Glasses has taken a look at the season from the Rays perspective. 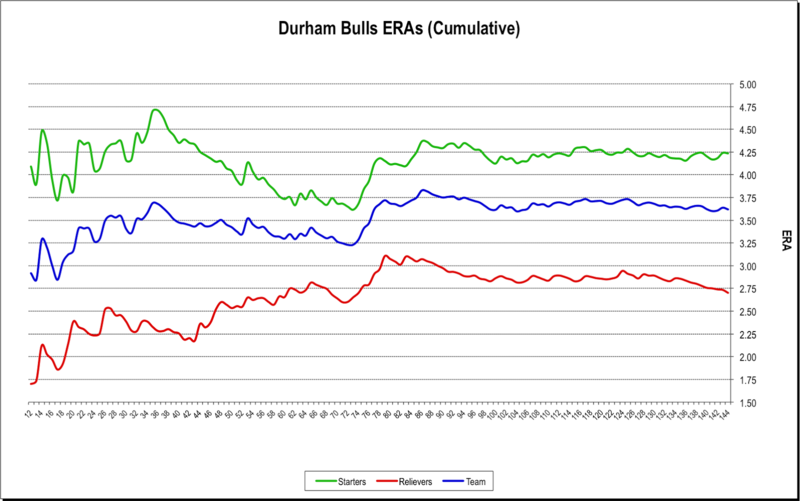 Overall, the Durham Bulls had 26 pitchers get up on the mound in 2014 and 21 different ballplayers came to bat. Overall stats. We’ll take a look at the individuals later. The first chart shows the Bulls off to a hot start. 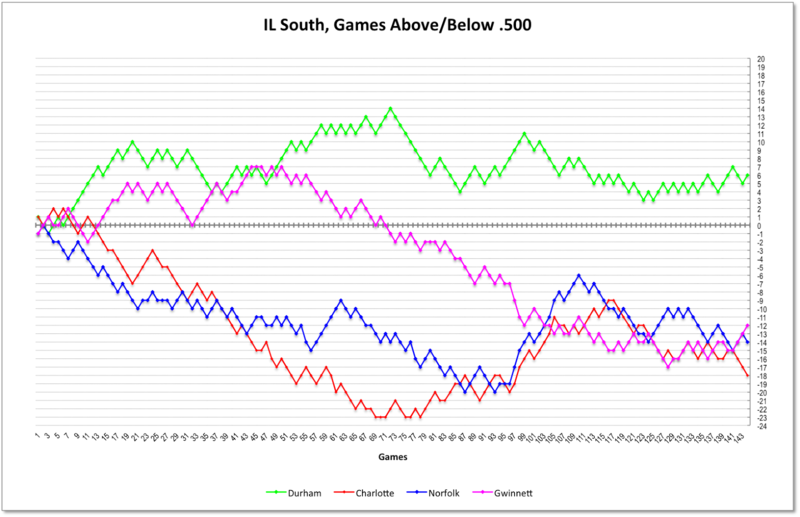 Remembering that early in the season the Bulls play mostly against their South Division competitors, those couple of weeks pretty much set the stage for the first half. However, the Bulls peaked at the exact mid-season, game 72 on June 15, at 14 games above .500. A huge fall-off from there to the All-Star break was followed by a fairly stable won-loss pattern for the rest of the year. In the meantime, only the Norfolk Tides (Baltimore) made a serious run at the South Division title, but they peaked at 7 games below .500. This is a striking difference from last year when the Bulls finished 30 games above .500. Nevertheless, enough to win the South and that’s good. 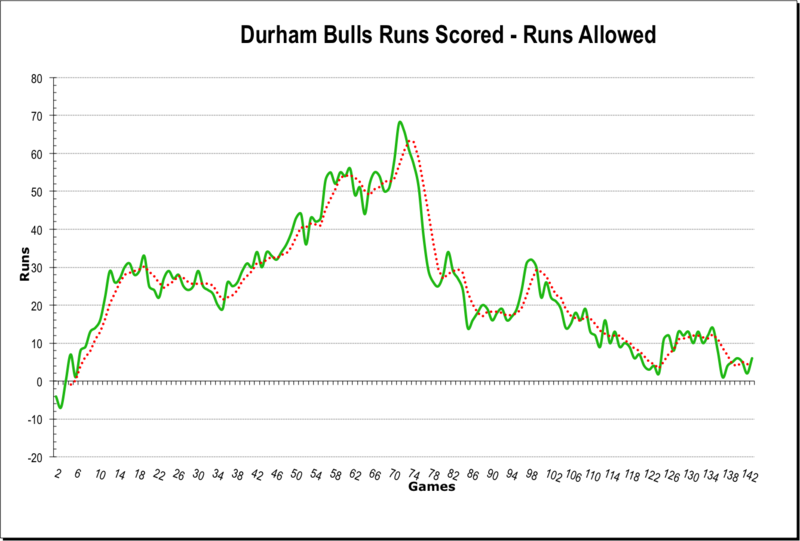 The cumulative runs scored less runs allowed chart follows a similar pattern and points out that the Bulls simply didn’t score a lot of runs this year. The Bulls strength this year was pitching. This chart tracks the ERA of the team after the first couple of weeks of the season. Notice how it jumps up at exactly the same time that the Bulls fell off their games above .500 high mark in mid-season. However, as a group, the 2014 starting crew really wasn’t all that good. At their best, the starters were a little above 3.50 and by season’s end they were around 4.25. Again, a distinct difference from the 2013 crew. However, the performance of the relievers was simply stunning. They were extraordinary at the start of the season, had some troubles mid-season, but certainly looked great at the end of the year. The 2014 hitters, not so good. 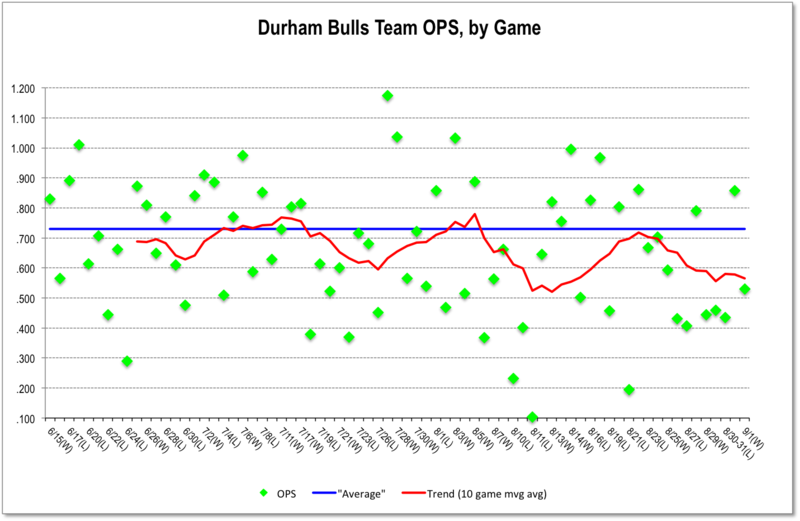 In fact, the Bulls had the worst batting average in the International League, .248, and were 12th of 14 in team OPS. This busy-looking chart is a plot of the game-by-game OPS of the last half of the season. The red line is a trend. What’s important to note is how rarely it even approaches an “average” OPS. Not a good year at bat. What's missing from all these charts is the good time we had at the ballpark this year. Lots to cheer about, a lot of terrific baseball was witnessed, and a pretty terrific renovation. More about that later.